Attention all you Top Gear fans out there! While most of us will never be a big enough star to actually appear on the fabled British motor show as one of its "Stars in a reasonably priced car," the Top Gear website has added a virtual chance at fame and glory. 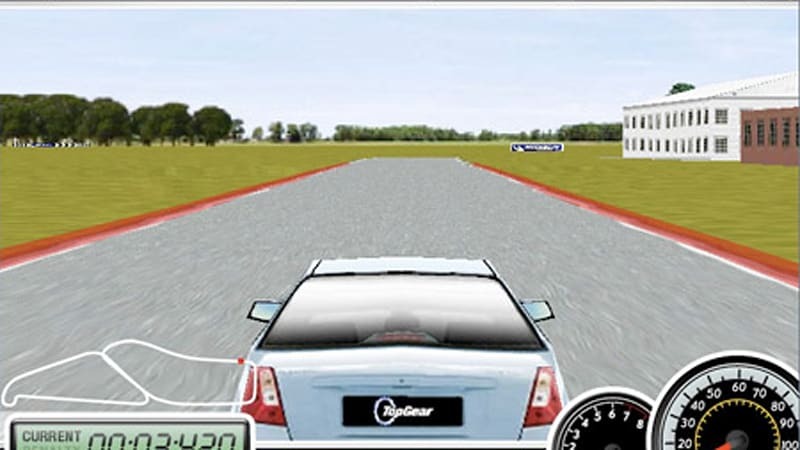 Take a crack at the real Top Gear test track just like The Stig! Pilot your Chevy Laceti around Chicago Corner, through Hammerhead, past The Follow-Through, and blast out of Gambon for the perfect lap. Current lap record holder is Alan G. with a blistering 1:41:193. If you think that's easy to beat, know that we only managed a 2:02:011 on our first full lap. It's not as easy as it might at first appear, as the rather crude graphics belie the trickiness of the controls and course. Check out the "Time to burn?" tab on the site to see how you would match up against Simon Cowell, Hugh Grant, and the Well spoken man. Hopefully you'll be able to beat at least Jimmy Carr. We'll keep at it and try to at least beat Brian Cox before the show returns to British airwaves this weekend for Series 11.